Happy Friday again! Hope you had a great week. I sure did, partly because I really enjoy what I do, which sometimes can get very confusing… “am I working or playing?”. Yesterday, I was taking pictures for todays blog post and had a moment were I just felt guilty, like I should get to work, but I was doing what I needed to do…Have you ever experienced something like that? I love that I get to wear so many hats, thats one of the perks of being part of a small family owned business. Yesterday’s hats were photographer, editor, marketing, graphic designer, and oh the list goes on, and now today I get to talk to you about something I am so excited about. Tables! Ok, I know what your thinking, tables is not a fun topic. Just wait until you see the pictures I have for you, tables is a totally fun topic. You see, these are not your grandma’s wood tables. Not that there was anything wrong with them! They were solid wood, sturdy, and they last a lifetime. With all those qualities I just mentioned, maybe these are your grandma’s wood tables, they just look different. I don’t know who decides the trends or makes styles change, but they do change. Somehow we end up liking the new, and grow tired of the old. Again, nothing is wrong with the old styles of tables, some were done pretty awesome. But table styles are changing, actually, not just tables, whole house layouts are changing. Dinning rooms were once separated from the rest of the house, they were set up as an elegant room only used for company or holidays. I see the formal dinning room being removed from the home more and more, both in new construction and remodel work. 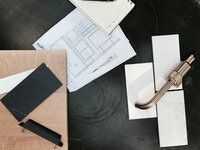 They want big open floor plans, where everything flows together into one cohesive look and feel. They want homes where you can be in the kitchen and know what is going on in the living room. They want entertaining to be seamless where guests can easily mingle in every area of the home. Everyone wants simplicity, simplicity in life, living, and mostly in style. 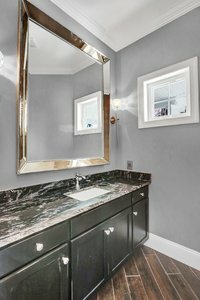 As much as it was fought the new modern, style has actually seeped into a lot of other styles. The industrial style is a fairly new style that has seemed to take the country by storm. You see it everywhere. Metal legs with solid wood tops are great examples of a simple industrial style table. All of the above, all the changes in style, function and design over the past 20 years, had led to what I call the reinvention of the dinning table. Tables that are sleek, simple, and have straight lines, have taken the stores by storm. I don’t know if it was Restoration Hardware, Joanna Gains, Pottery Barn, or just the changing of the times, but these simple designs are propelling into demand everywhere. You see a lot of metal legs (industrial), simple, straight legs that are the same as the table top (modern) and because of the warmth of the wood, these styles of tables work in any style of home. Allowing your dinning table to be as simple and understated as needed in an open floor plan. Although, some of these woods are so beautiful, how can they be understated? Right? Another sycamore table with black metal legs, and two sycamore benches. sycamore countertop with live edge. Live edge means its the outside of the tree, so you have the actual shape of the tree on the edge of the countertop. sycamore coffee table. 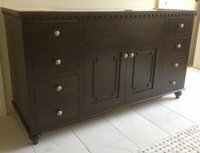 sprayed finish, just like our cabinets. Thanks for visiting! 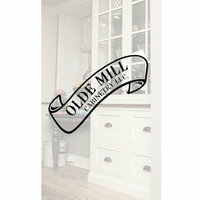 You can always leave a comment or send me an email: sales@oldemillkitchens.com if you have any questions.